The Boston Bruins and Monteal Canadiens will meet in a deciding seventh game on Wednesday night at the TD Garden for the right to move on to the NHL Eastern Conference semifinals, and the desperation will no doubt be palpable on both sides. For the Bruins, it could very well mean the future of coach Claude Julien. After last year’s embarrassing playoff exit at the hands of the Philadelphia Flyers, losing the series after being up 3-0, this year’s playoff loss would be a major disappointment for a team expected to do so much more. The Canadiens have nothing to lose. Their surprising run to the conference finals last year solidified that status of coach Jacques Martin, and they were the decided underdogs coming into this playoff matchup as well. Julien’s record in the playoffs during his tenure with the Bruins is not one that would be impressive on a resume. The Bruins are 2-8 in series clinchers, and 0-3 in seventh games. However, none of that really matters tonight. What matters is how the Bruins will respond to adversity. The Bruins will also need to keep themselves from committing mindless errors. Last night in Montreal, a too many men on the ice penalty was shortly followed by a slashing call, leading to a five-on-three situation that created the opportunity for Montreal’s first goal. Ditto the second Montreal goal. Milan Lucic committed a major blunder with his boarding call, followed by Patrice Bergeron firing the puck into the crowd on a clearing attempt. Delay of game, another five-on-three situation, another goal for Montreal. That type of play will have the Bruins golfing on Thursday morning if it’s repeated on Wednesday night at TD Garden. 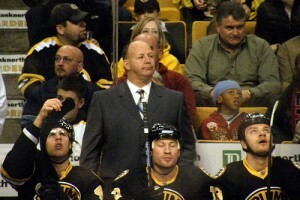 And that type of play could have Julien on the unemployment line as well. For continuing coverage of the Boston Bruins, follow us on Twitter @chowdaheadz.